Aquilegia alpina is an outstanding blue columbine, typically growing 12-24 inches high. Nice choice as an accent plant among groundcovers such as sweet woodruff, forget-me-nots and periwinkle. There are dozens of species of wild columbines, and many cultivars of the perennial Aquilegia Ranunculus, which is part of the Buttercup family, native to Asia, Europe and North America. Columbine flowers – equally attractive to people, butterflies, moths, bees and humming-birds, feature five long-spurred petals and five petal-like sepals which appear in spring and early-summer and can persist through the summer on established plants. Most of the flowers are nodding, but some newer cultivars face upwards. Colors vary from single to bicolors in shades of purple, blue, white, pink and yellow. Aquilegia caerulea is the state flower of Colorado; sometimes called Colorado Blue Columbine or Rocky Mountain Columbine. Usually bicolored, with the sepals being a different color than the petals. Drought-resistant. Aquilegia canadensis is a free-flowering wild columbine that readily self-seeds. Lovely in the rock garden or woodland garden, interplanted with bluebells, trilliums and ferns. flower the first year from seed. Sew seed outdoors, in fall or spring, covering with a light layer of soil, or start the seeds indoors over the winter, after storing in the fridge for a month or so. Columbine hybrids tend to be short-lived, so grow new plants every couple of years for a constant landscape display. Columbines thrive in sun or partial shade and are generally hardy from Zone 3 to Zone 8, with some zone variations depending on species. Most garden soil, providing it is well-drained, is suitable for aquilegia cultivation. Mulching around the plants if you like, but it isn’t necessary. Leafminers can be a problem, so if you find any infected leaves displaying pale blotches or tunnels, remove and destroy them immediately. If the problem persists, try a weekly application of insecticidal soap. Borers can also attack, causing infected plants to fail rapidly; you must remove and destroy all parts of the affected plant to help prevent further infestation. Production Tips For Top Performers: Aquilegia vulgaris – from the Floriculture Program at Michigan State University. Trial results and cultivation tips for Winky cultivars with upward-facing flowers. Wikipedia – Aquilegia – list of species, general information, evolutionary background. 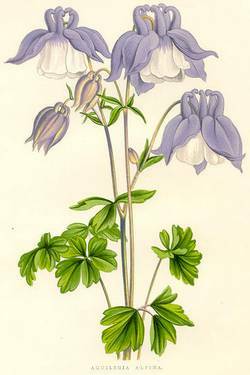 USDA: Aquilegia L. columbine Plant Profile – maps of the United States, identifying native and introduced columbine species in each area, images and classification.